Naturopathix, Inc. has introduced ZymaDerm™ the all-natural choice for fast, powerful relief from cold sore misery comprised of a unique blend of soothing essential oils and organically bound trace minerals to rapidly dry out and help heal cold sores and fever blisters. 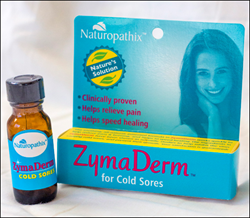 ZymaDerm™ helps to quickly dry out and heal cold sores and fever blisters … often within minutes of application. Naturopathix, Inc. introduces a full strength topical, all natural, homeopathic treatment under its ZymaDerm™ brand for relief from the pain, itching and burning sensations associated with cold sores and fever blisters. ZymaDerm™ Formula for Cold Sores is based on a similar safe and gentle, drug-free, anti-viral solution that has made it the leading and physician preferred treatment for Molluscum Contagiosum. Its cold sore treatment is also an FDA approved homeopathic formula that is a blend of soothing essential oils and organically bound trace minerals. “The terpene compounds in ZymaDerm™ for Cold Sores have anti-inflammatory, antiviral, and antibacterial therapeutic properties. The essential oils in our formulation organically bind trace minerals that enhances the availability of iodine for therapeutic purposes”. ZymaDerm™ for Cold Sores all-natural homeopathic ingredients include iodine derived from seaweed extract, QACs (Quatranary ammonicum compound) and plant derived terpenes including: Mentha piperati (peppermint oil), Geranium graveolens (geranium oil), Melissa officinalis (Melissa oil), and lemongrass oil. The essential oils include Melaleuca alternifolia (narrow-leaf paperbark tree), jojoba oil, and cinnamon oil. This herbal proprietary blend is used to cleanse the skin and to retard or inhibit the growth of harmful bacteria and viruses. Naturopathix, Inc. founded in 2002, develops safe, effective and inexpensive treatments for common health conditions. It utilizes state-of-the-art knowledge combined with a low technology approach to reduce the high costs of medical care for patients. It markets ZymaDerm™, the only full strength topical homeopathic for molluscum contagiosum. The ingredients in ZymaDerm™ are based on a patented blend of powerful all natural plant-based compounds officially included in the Homeopathic Pharmacopeia of the United States that the FDA recognizes by law as authoritative. The potency and level of purity of the ingredients in ZymaDerm™ meet the most stringent standards of excellence. It is available in over 20,000 pharmacies including leading chain drugstores, such as CVS and Walgreens, and online merchants such as drugstore.com and amazon.com.